If you and your family were going to have your photograph taken it probably would not take that much time to arrange. Cameras are small and photos can be taken instantly. However, in the 19th century having your photo taken was quite different. A photographer would come to your house to take the photograph – usually on a special occasion, like a wedding. The group would pose carefully and everyone in the photo would have to remain very still for some minutes. Look at Source 1. At first glance, it seems like just another Victorian photograph – but look again. This is a photograph of Queen Victoria and some of her children on a very special and normally happy occasion. But no one looks very happy. Why? 1. Source 1 is a photograph of Queen Victoria and her family. Why was the photograph taken? Hint: what kind of clothes is the woman standing on the left wearing? Prince Edward and his wife Alexandra are the only two people looking at the camera. What do the others seem to be looking at? Why is there a bust of Prince Albert in the photo? Queen Victoria wanted to give whoever saw this photo a message. Can you work out what that message was? 3. 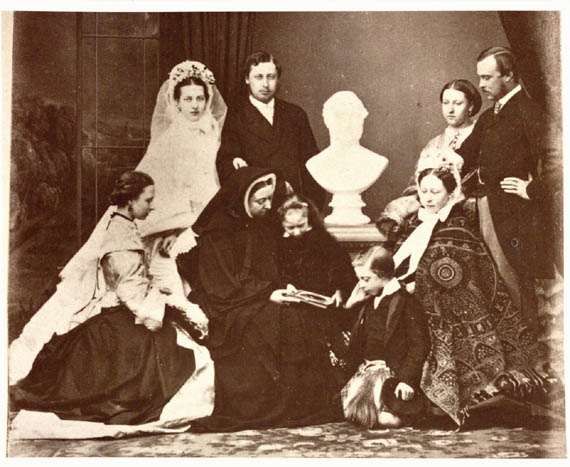 This is a later photograph of Queen Victoria with members of her family. How does he look different and why? Is the child in the centre a boy or a girl? What makes you think that? How many different generations can be seen in this picture? Do you think this photograph has a message? What do you think it might be? Both Victoria and Albert spent a lot of time with their children at Balmoral in Scotland and Osborne House on the Isle of Wight. In 1861 Queen Victoria’s husband Albert died. Victoria was devastated. She went into mourning. She wore black for the rest of her life and for many years locked herself away from the public. The wedding of Prince Edward to Princess Alexandra of Denmark took place two years after the death of Prince Albert. Clearly Queen Victoria was in no mood for celebrations. She could not even face the wedding reception without Albert, so she had lunch alone. By the 1860s family photographs had become quite common in Victorian England. Successful photographic experiments had first been carried out in the 1820s but the ability to photograph people did not arrive until the work of Louis Daguerre and Henry Fox Talbot in the 1830s. Even though photography was now familiar it was still a slow process. Cameras were large and heavy and had long exposure times (the time the film had to be exposed to light) meaning that people had to stay very still throughout a session with a professional photographer. Only with the invention of simple hand held cameras in the early 1900s could ordinary people take their own ‘snaps’. This lesson looks at Queen Victoria and her relationship with her family. It can be used with pupils at key stage 2 for the History National Curriculum in year 4 and could also be adapted to use with year 3 pupils. The lesson could be extended to work with decoding other photographs or portraits. Why are people shown the way they are? Children could write about or draw their own family portrait. How would they like to be portrayed? Source 1 is COPY 1/3/327, a carefully arranged photograph taken after Prince Edward’s (the future King Edward VII) marriage to Princess Alexandra of Denmark in 1863. From left to right can be seen Princess Louise, Princess Alexandra, Queen Victoria, Prince Edward (‘Bertie’), Princess Beatrice, Prince Leopold, Princess Alice, Princess Helena and Princess Alice’s husband Prince Louis of Hesse. Source 2 is COPY 1/438/728, another formal photo of the Royal Family taken in 1898. From left to right can be seen an older Prince Edward, his grandson Prince Edward of York (the future King Edward VIII), Princess Victoria of Wales (‘Toria’, Prince Edward’s second daughter) and Queen Victoria, now in her eighties. Literature, history and culture in the reign of Queen Victoria.